Baraka is an ancient Sufi word, which can be translated "as a blessing, or the breath, or the essence of life from which the evolutionary process unfolds." It is also the title of an extraordinary documentary by Ron Fricke, universal as only an unspoken movie can be, with wondrous imagery. You can see it in full with the link below, at 1080p quality, which it well deserves! Personally, I was particularly moved by the 13 minute time-frame. 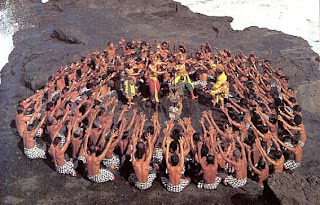 As far as I could research, it is called "Kecak", a dance/musical drama from Bali, also known as the Ramayana Monkey Dance and it portrays a specific episode of their mystical history and is executed as a form of exorcism. How about you? What moved you most?